With all of the busyness of the holiday season, I have to rely on quick and easy dinner solutions! Not only are the days getting shorter, but it feels like literally, there just aren’t enough hours in the day to get everything done! By the time dinnertime rolls around, I am not really motivated to make anything lavish or complicated … and to be perfectly honest with y’all, there are plenty of days where I want to feed my family cereal for dinner. But I don’t. Thankfully, I have a few recipes on hand that are so easy for days that I just need something quick and delicious! As you know, Sloppy Joes are one of Brian’s favorite meals and as I have told you before, I can only take Sloppy Joes (or any recipe, for that matter) so many times before I have to find a new way to make them. 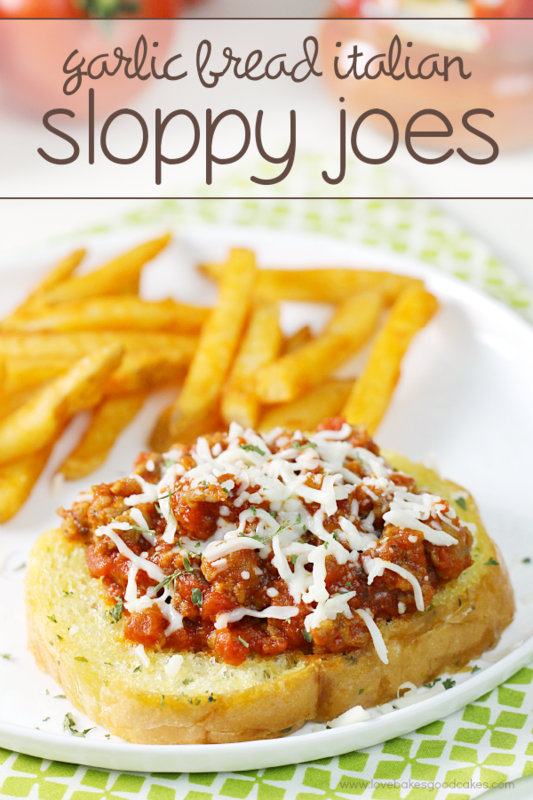 One of my faves ways to eat Sloppy Joes is on pizza or in a tater tot casserole! 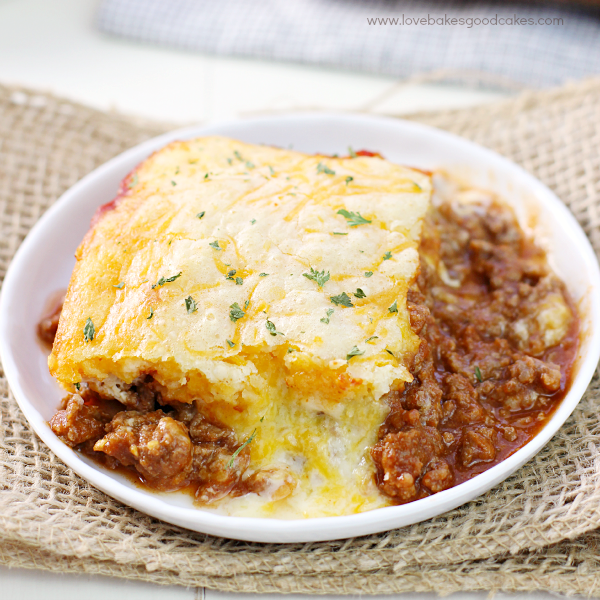 Brian tends to like the traditional sandwiches – or this Cheesy Sloppy Joe Bake! 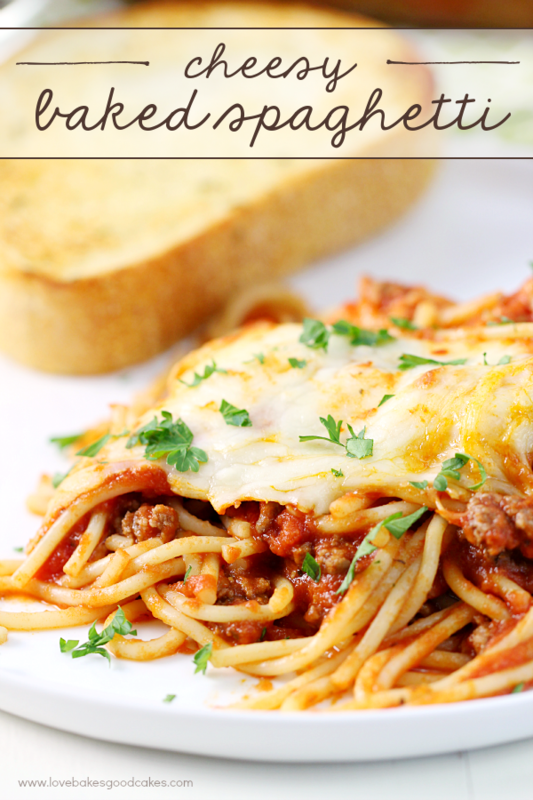 I have to admit, with how quick this is and how much my family enjoys it, it has quickly become a staple for a quick and fuss-free meal! 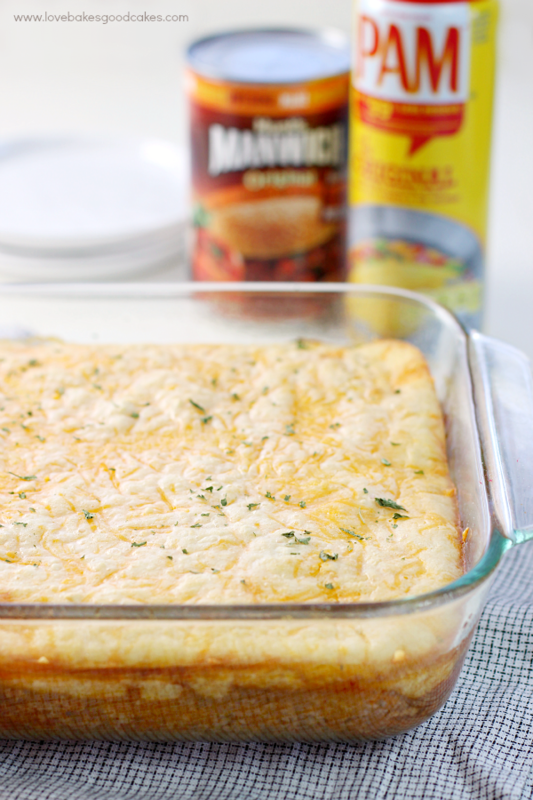 MANWICH and PAM cooking spray are perfect for helping create easy yet delicious holiday meals, holiday side dishes, and good old-fashioned comfort food – like this Cheesy Sloppy Joe Bake! They make a great start for dinner recipes and they help save time with easy, stress-free recipe creations, especially during the holidays! 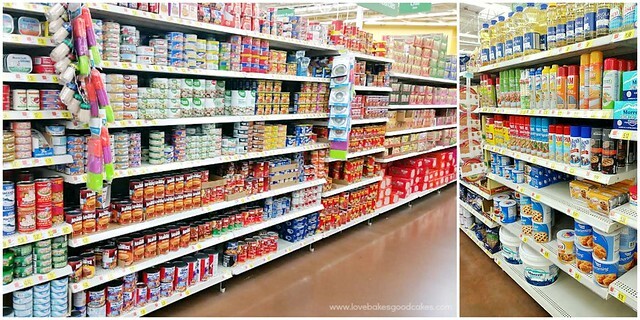 A quick stop at Walmart keeps my pantry stocked with MANWICH and PAM cooking spray! 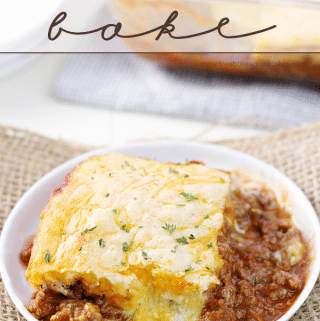 Pair this Cheesy Sloppy Joe Bake with a fresh salad from Walmart’s produce section and you’re all set for an incredibly easy and delicious meal your whole family will love! 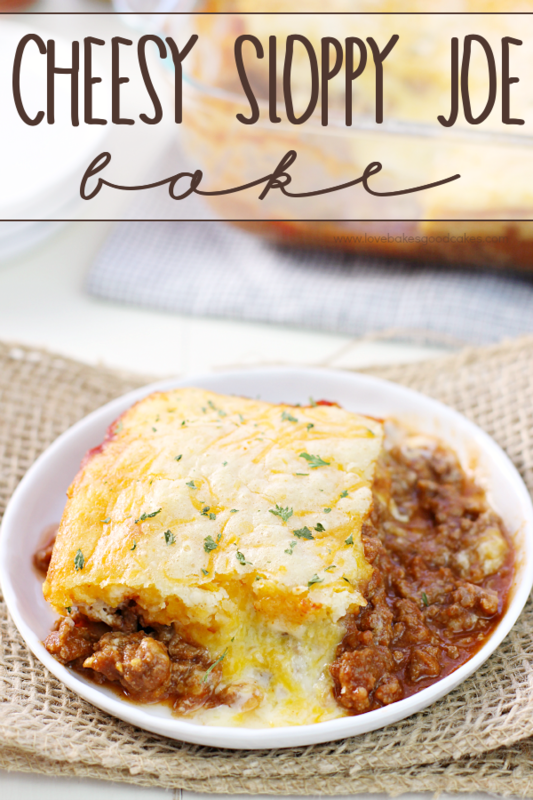 Your family is going to love this Cheesy Sloppy Joe Bake! Preheat oven to 400°F. Spray an 8x8-inch or 9x9-inch square baking dish with PAM cooking spray and set aside. Brown and crumble ground beef in a large skillet over medium-high heat until meat is no longer pink. Drain, if necessary. Stir in the MANWICH. Spread beef mixture into the prepared baking dish. In a small bowl, stir together the pancake and baking mix, milk, and eggs with fork or wire whisk until blended. Pour over the cheese. Bake about 25-30 minutes or until knife inserted in center comes out clean. 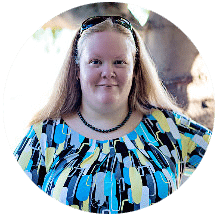 Find more easy to make recipes that are perfect during the holidays by visiting this link: Yes You Can Recipes! This looks good. Sloppy Joes are my favorite comfort food. What does "pancake and baking mix" mean? The powder batter from a pancake box? What does "pancake and baking mix" mean? Is it just pancake batter mix from a box? 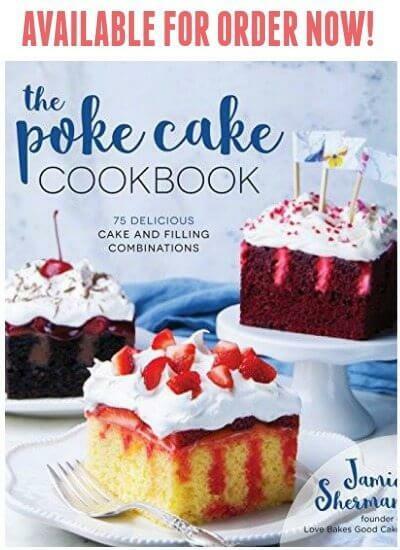 This looks amazing Jamie! I am in the mood for something cheesy and comforting! I think I'm going to try this one! I'll probably use ground turkey. Thanks for sharing it. could you use cornbread muffin mix? You could! You may need to adjust cooking time, though! The Cornbread Muffin mix sounds really good too. I might try that. could you use corn muffin mix? This looks incredible with that gooey cheese on top. I LOVE Sloppy Joes…but I've never had them baked with cheese before. Sounds delicious!!!! I haven't made sloppy Joes in forever! I like that this is quick to prep for the oven and then you get a chance to catch your breath for a bit. Perfect for capturing a little time with children or just relaxing in front of your favorite screen. Oh my Jamie! You are killing me here! This looks so good! never thought of using pancake mix! So trying this! This would provide leftover for days. Yum! 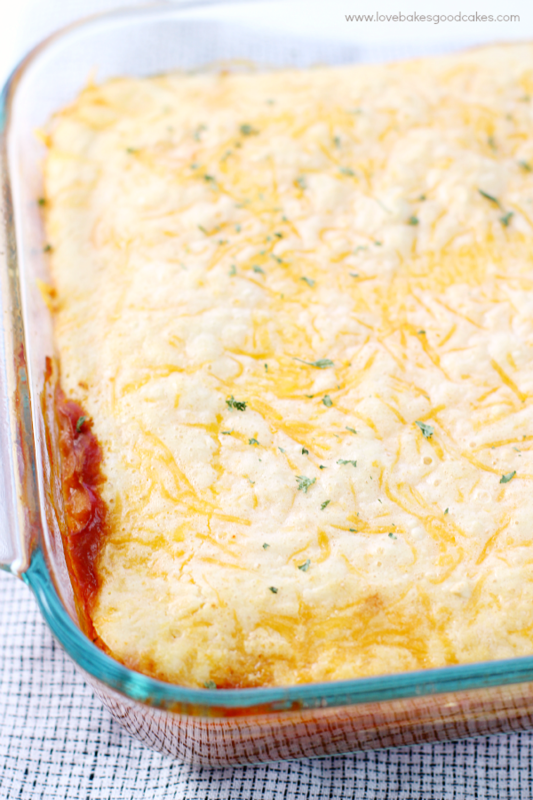 Love this twist on one of our families favorite dishes!! I made this, and I LOVED it!! So easy to do. I was looking for a new way to fix sloppy joes, and you came through! Thank You! !